Here in Hawaii, SPAM is a household staple, a local comfort food, a cultural mainstay, and the best part of musubi. No trip to Hawaii is complete without a taste of the beloved canned meat. It's a remarkably versatile food, and very comforting, especially if you grew up eating it. To further your SPAM education, we went ahead and dug up some SPAM-related facts that'll take (almost) all the mystery out of our favorite mystery meat. First, the six ingredients are mixed together and pumped into each individual can. Moving down the conveyer belt, the product is sealed, cooked, cooled, labeled, then boxed before shipping out across the globe. And you, too, can join in on the worship... or, at least, become Facebook friends. Maybe you’ve seen the Monty Python skit in which two customers sit down at a greasy spoon, where practically all of the menu items are meals featuring SPAM. Well, this festival is like the restaurant come to life -- only, you know, way better. Each year, the canned meat-loving festival shuts down Kalakaua Ave, and local restaurants serve up creative SPAM dishes like SPAM fries, SPAM tacos, SPAM ahi katsu, SPAM lau lau, SPAM chips, SPAM mac & cheese, SPAM noodles... even SPAM desserts. The event features two stages with live entertainment, Spam merchandise, and island-made products, while mascots Sir Can-A-Lot and Spammy roaming the roads, ready for photo ops. Over 25,000 attend the event annually, and according to Hormel broker Scott Gamble, "a lot of tourists that come to the island plan their trip each year around the event. It gives them an opportunity to come out here and celebrate their love for the brand and be in Hawaii for vacation." 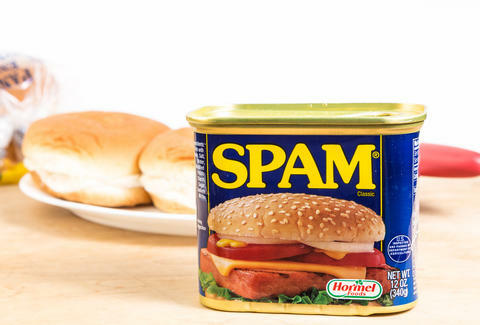 Although SPAM has been around for 79 years, Hormel Foods SPAM representative Jen Nolander says it’s relatively new in some international markets. 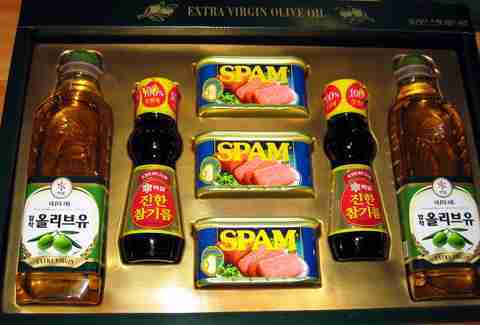 In South Korea, SPAM is given in high-end gift packs around the holidays. 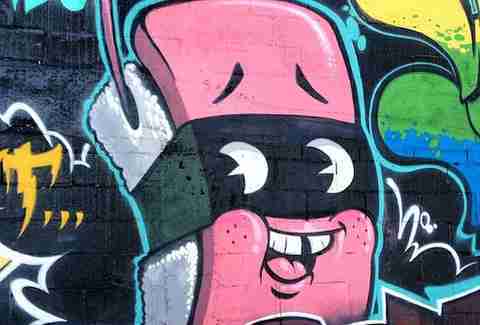 Jay Hormel developed the concept of SPAM back in the late 1920s, but due to the economy’s pork supply shortage, the launch was delayed and rolled out a decade later, achieving an 18% market share in its first year. In 1936, Jay Hormel held a contest and asked everyone at the party to come up with a name for his new canned product. An actor from New York named Kenneth Daigneau came up with the winning suggestion, but according to Nolander, "there aren't any hard facts about what ‘SPAM’ actually stood for in his mind. People speculate that he took the first two letters of ‘spice’ and the last two letters of ‘ham,’ and put them together to create SPAM." 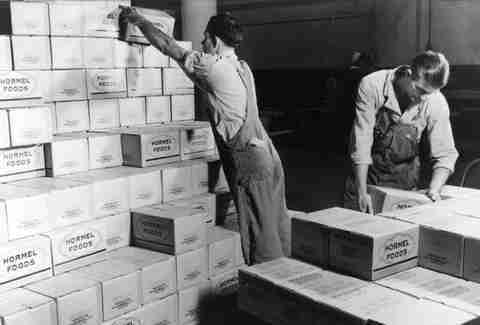 SPAM played a big part in nourishing troops during the war, when 15 million cans of Hormel products were shipped overseas per week... mostly SPAM. When the brand celebrated its 75th anniversary 50 years ago, President Dwight D. Eisenhower wrote to Hormel Foods, "I ate my share of SPAM, along with millions of soldiers. I’ll even confess to a few unkind remarks about it. As former Commander in Chief, I officially forgive you your only sin: sending us so much of it." 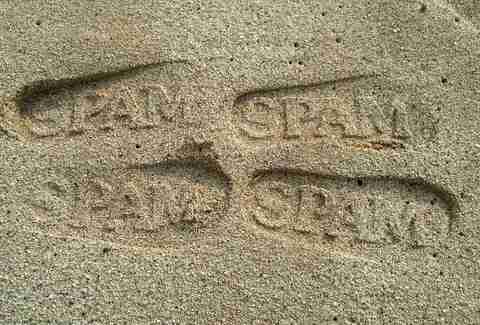 The SPAM brand’s first attempt at experiential advertising in 1945 featured an all-girl group of veterans and servicewomen. The girls traveled the country, singing, dancing, and playing instruments, often traveling in a group of 25 white Chevrolets... all to sell Hormel products. By 1948, the group comprised 60 women, a 16-piece orchestra, and its own radio show, but disbanded in 1953 as the television age slowed radio listening. It’s a good thing so much SPAM can be whipped up so quickly, because Hormel Foods calculates that 12.8 cans of SPAM products are consumed per second. The hard-to-perish product has been around for 79 years, and is now sold in over 44 countries. For the second year, the SPAMERICAN! Food Truck Tour is hitting the road, traveling to 16 towns across the United States. This year, SPAM is partnering with Operation Gratitude, an organization that sends care packages to servicemen and -women. For every letter of thanks written on tour and online, SPAM will donate one dollar to the organization, and will include a letter in a care package. In case all that penmanship makes you tired, local chefs will churn out complimentary creative SPAM recipes like SPAM corn dogs, SPAM bahn mi, or cinnamon-crusted SPAM with apricot jam drizzle. 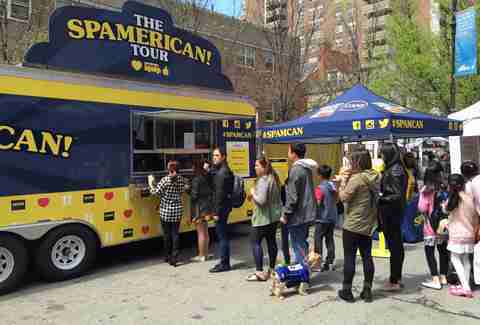 To the tune of R.E.M’s "Stand," Weird Al sings about SPAM addiction... much like Sam-I-Am eats green eggs & ham. 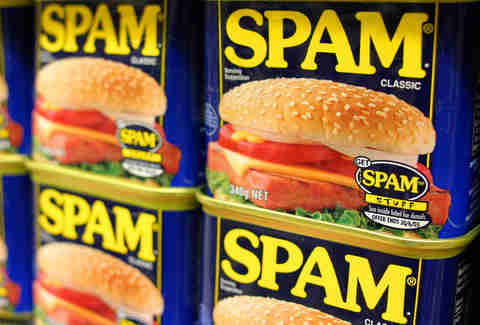 It’s practically common knowledge that islanders love SPAM -- in fact, we eat about 7 million cans of the stuff a year. Monty Python has spoofed SPAMfor decades. 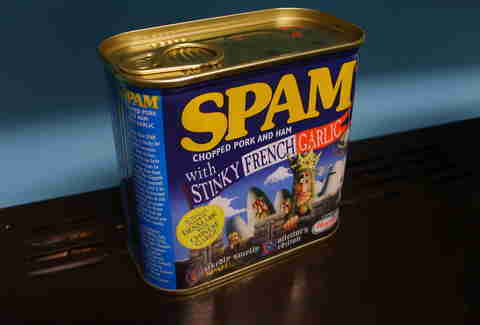 So in 2004, when Spamalot, the "lovingly ripped off" live musical of Monty Python and the Holy Grail opened on Broadway, Hormel Foods released a new, limited-edition flavor, SPAM Golden Honey Grail. And when Spamalot opened in West End, Hormel’s response was to release a special collector’s edition tin of Stinky French Garlic SPAM, of course. Adorned with knights covering their noses, the can read, "Actually made in Denmark with Chinese garlic." And in case you missed it, you can still buy an unopened case of Golden Holy Grail for a mere $200 on eBay. 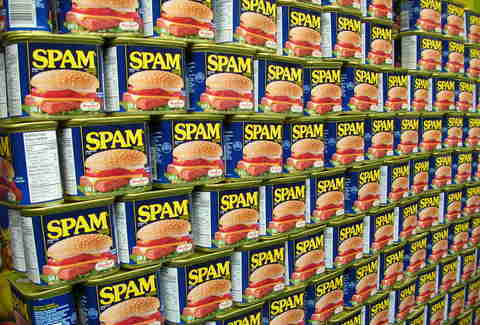 Proceeds from the SPAM Jam in Hawaii go to the food bank, and Gamble says canned protein is its No. 1 request, and out of that, SPAM is the No. 1 pick. The first SPAM museum opened in 2001, but closed temporarily in SPAM’s hometown of Austin, MN. It was then relocated to the heart of Downtown, amongst shopping and restaurants. The new SPAM Museum is 14,000sqft of SPAM glory, featuring SPAM history and interactive galleries where you can learn everything you ever wanted to know about the canned meat treat. The ingredients are listed right on the can. According to Nolander, what you see is what you get. SPAM Classic consists of just six simple ingredients: pork with ham (so, like, pig chopped up with more pig), salt, water, sugar, potato starch, and sodium nitrite, which helps uphold the quality of the product. Of course, this is 29in of musical joy, made from a clean, empty, classic SPAM can and featuring 10 frets for your canned meat-loving fingers, so you can create some sweet, sweet songs. Summer Nakaishi is a freelance writer for Thrillist, and although she hasn’t counted, at some point in her life she knows she has lived up to the Hawaii statistic of eating five cans of SPAM per year... and she's damn proud of it.